Finally we are proud to announce the eagerly-awaited DVD production of STARMUS – SONIC UNIVERSE, a release of the sensational musical collaboration between two legendary names: Brian May and Tangerine Dream. Brian May had been for decades the great guitar player, arranger and co-singer with one of the greatest rock bands of all time: QUEEN. Tangerine Dream came from a complete different angel of the musical world. Being the first band ever using Moog sequencer rhythm live on stage, being called the early masterminds of ambient sound and highly acclaimed Hollywood film composers for many years, Tangerine Dream have set more than one landmark in musical history. 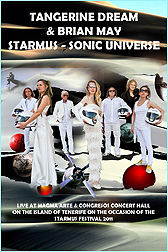 Now here is the result of a very unusual concert of the two legends at the Starmus Festival on the Island of Tenerife. In June 2011 this festival was held in the honor of the 50th Anniversary of Juri Gagarin’s first spaceflight. Among the guests you could witness Neil Armstrong (first man on the moon) in one of his last public appearances and Buzz Aldrin (second man on the moon), Alexei Leonow - first man stepping out of his capsule into space, Jim Lovell and many more. The first track of the DVD - SUPERNOVA - integrates ORIGINAL, REAL STAR SOUNDS – something very special. Prof. Garik Israelian, astrophysicist and founder of the STARMUS FESTIVAL captured these unique sounds. Can you imagine how the sun sounds in space? Get an idea of this sound when listening to SUPERNOVA. Enjoy with this release the highlights of TD’s musical career in combination with Brian May’s unique guitar. Dedicated to Edgar.